Will Studying Math Make You Richer? A Fed study says yes. You should be smart enough to be skeptical—especially if you studied math. Students who advance further in high school math have higher wages and are less likely to be unemployed, according to a new study from the Cleveland Fed. So when Noah Smith and Miles Kimball say there is a "math person" in all of us, listen up. The study shows that advancing past Algebra II correlates strongly with finishing high school, graduating from college, and thriving in the workforce. Here's your money chart, with "low-math" students to the left and "high-math" students to the right. 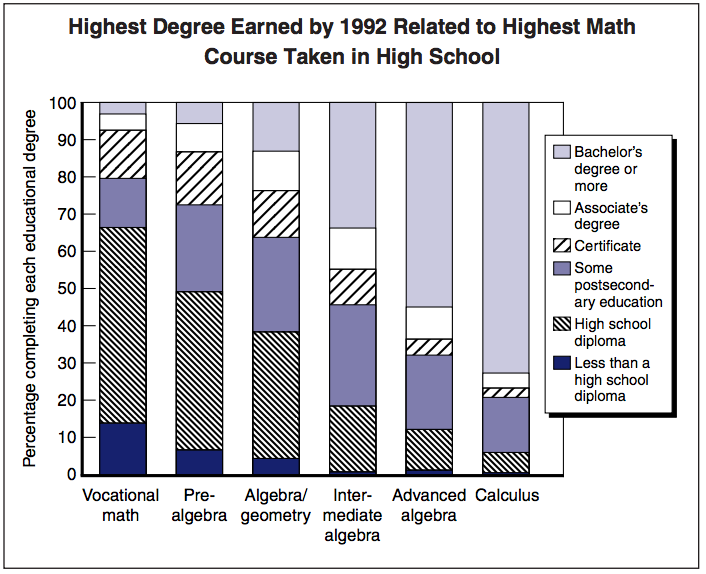 This finding (relatively simple as it is, since Algebra II isn't particularly advanced) sits comfortably with a 2001 finding that more-advanced math courses in high school went on to get higher levels of education. Before you run out to petition your local government to require each graduating high school student to become a calculus pro, I should warn that even the economists behind these reports are cautious about their implications. "It would be a mistake to require all students take calculus," say Heather Rose and Julian R. Bett, the authors of the "Math Matters" paper whose key graph is excerpted above. First, it's not clear our high schools have the teachers necessary to meet that demand for calc. Second, if we force highly advanced math courses on all students, we might be encouraging some students to drop out while the struggling students who remain encourage teachers to water down the work required to complete those courses. (1) It's causation, plain and simple: Math totally makes you rich. Do you want to be rich? Study math. It will give you skills for which you will be rewarded with higher wages in practically every industry, because math skills are inherently valuable and having them make you more valuable. It could be that people take more math in high school because they’re smarter than classmates who go equally far in their education, are harder working, or both. They succeed in their careers because of those qualities, not because they know that the derivative of cos(x) is -sin(x)." (3) It's a little bit of both: Within the pool of smart kids, those who take lots of math tend to want, or are eventually drawn to, the kind of jobs with high wages, and smart kids who take lots of English classes (e.g.) tend to want, or are eventually funneled toward, jobs with lower wages, even if they're just as "smart." This is the most complicated interpretation, but also the one that maps onto my personal experience. Students who show an interest in math and related fields are often drawn into an orbit of higher-paying job opportunities, like finance and consulting. That means that, if you're smart, it does matter whether you take advanced math courses, inasmuch as higher-paying jobs in finance, consulting, marketing, accounting (you know, business) require math skills, while other jobs in government, non-profits, and journalism, are populated by decently smart people who (a) aren't trying to maximize their income and (b) wouldn't have been helped much with math in their current jobs. In other words, the "math-->riches" equation is a little bit of causation and a little bit of correlation. Update: (4) The underlying variable is income: Students from higher-income families in higher-income areas (who are more likely to get into better colleges and have access to well-paying jobs) are more likely to go to well-funded schools that compete for the best and brightest students, which means they're more likely to not only offer calculus but also build a culture of calculus-takers staffed with good teachers to make the material accessible.